The NSPB celebrated its 50th Annual Conference and AGM on 17th December, 2017. During this historic occasion NSPB is honoring the people who have worked for the cause of Prevention of Blindness and giving the Gift of Sight to our less fortunate visually challenged countrymen. The purpose of these awards is to recognize them and motivate them to continue their selfless work. It is because of such sight ambassadors that NSPB has the touched the lives of millions of people. The name of the awardees and their brief achievements are given under here. The awards and trophies were presented to this Gift of Sight ambassadors by Shri Ashok Maheshwari, Chairman of the Nagar Palika Parishad Modinagar appreciated the efforts of the NSPB in giving the gift of sight. As a part of its ongoing program to give the gift the sight to those who are needlessly blind, NSPB has a robust advocacy program for its eye donation campaign. Dr Rajiv Mohan, eminent Ophthalmologist from Delhi gave a talk exhorting all of us to donate the eyes after one is no more. Dr Mohan also emphasized how one pair of eyes of person who is no more can help two visually challenged person see and get the gift of sight. 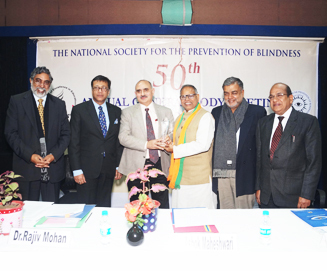 Dr.Devendra K. Modi, Chairman of the K N Modi Foundation and a noted Philanthropist has been a goodwill ambassador for the cause of eye donation and cornea transplant. Institutions and hospitals under Dr. Modi has helped thousands of persons to get the gift of sight through cornea transplants. He has again continued his effort in this direction by motivating his team of faculty, students and citizens to donate their eyes after they are no more by handing over 1000 eye donation pledge forms to NSPB. Mr S K Nair, Secretary General of NSPB said that the NSPB is very shortly starting its state of the art eye Hospital in Karkardooma, East Delhi which will provide best in eye care, particularly for the poor and the destitute. This is one of the steps that NSPB is taking to take forward its vision that no one is needlessly blind. The funding of the activities of NSPB is entirely through charity, donations, and support of philanthropists, he said. DR. SANDEEP MITHAL, FORMER PRINCIPAL HOD OPHTHALMOLOGY MEERUT MEDICAL COLLEGE, MEERUT (U.P. DR. SANDEEP MITHAL is a renowned Ophthalmologist from Meerut, Uttar Pradesh. He was the Principal of LLRM Medical College, Meerut and also Head of Ophthalmology. Dr. Sadhu-Ram Gupta from Glasgow, UK is an internationally acclaimed Ophthalmic Surgeon & Philanthropist.. Dr. Sadhu-Ram ji has been supporting the NSPB’s charity and efforts in the remote areas of Himachal Pradesh and helping NSPB give the Gift of Sight to the poor and the less privileged in Himachal. He has worked as Chief Eye Surgeon &HOD at GM ModiHospital(NSPB) Modinagar for 10 yrs and has several international academic laurels to his credit. He was trained as a Community Ophthalmic Surgeon at GinniModi Ophthalmic Research Centre, Modinagar for 19 years, which he headed for several years. His dynamic leadership and missionary spirit helped the hospital to become one of the leading institutions of the region providing quality eye care services to the under – privileged strata of the society. SHRI RAJIV BHATIA is the Founder President of Rotary Club of Yamuna Nagar Riviera Former Chairman of Rotary Yamuna Nagar Riviera Eye Donation Centre, Secretary of Dayanand Education Trust and Life member of Baal Anaath Ashram (an orphanage). SHRI MOHAN LAL ARORA joined Shri Shakti Sewa Dal in 1982 and today he is the President of the Organization. ShriArora and his organization have been instrumental in the organizing hundreds of eye donations and enabling the gift of Sight. SHRI SUDHIR GUPTA is the Vice-President and Founder Member of the NGO DadhichiDehdaanSamiti. Shri Gupta and his team have been relentlessly and selflessly working and advocating the cause of organ donation. SHRI A P BANSAL has been working for the last 48 years with the NSPB at its Head Office in various capacities. In fact he is one of the oldest employees of the Society. SHRI DENNIS KENDALL has been one of the pillars and torch bearers of NSPB’s community ophthalmic program at the Raison Eye Hospital, Kullu as Incharge of the Hospital. SHRI BACHI RAM GAUR was part of the team at GMCORC that has delivered excellent Community Ophtlamic care to the poor and the needy. DR. DEVENDRA K MODI, Scion of the Modi Family is a noted Educationist and Philanthropist. He has greatly contributed to the cause of Community Ophthalmology in Modinagar and surrounding areas and helped thousands of poor and destitute with the Gift of Sight. N.S.P.B.’s PANCHMAHAL DISTRICT BRANCH has been adjudged as the Best District Branch for the year 2016-2017 for its meritorious work in the field of Community Eye health care. The Purba Mednipur District Branch in West Bengal is one of the oldest Branches of NSPB. The branch is holding eye camps and screening of school children.